It comes up in my blog from time to time but I am a scientist. I have a Ph.D. in molecular biology and currently work at a national lab outside of Washington D.C. I don’t do A LOT of chemistry with my beer…I measure gravities and pH sometimes….but I’d like to do more analysis. Part of that is just learning how to do it..and then doing it. I decided that there are a few things that I want to learn how to do. I’d like a more accurate way to measure alcohol, starch conversion, and IBUs. I’d also like to (eventually) measure the concentrations of different acids in my mixed fermentations but that is going to take a long time to set up. The first thing I’ve decided to tackle is the measurement of alpha-acids in my finished beers. As many of you know, the alpha acids found in hops are what is responsible for the hop flavor and bitterness in beer. Alpha acids, usually reported as a percent, is the variable most people use to calculate the IBU of the beer they are making. It isn’t just one acid, the term “alpha acid” refers to a group of acids found in hop flowers that include humulone, adhumulone, cohumulone, posthumulone, and prehumulone. 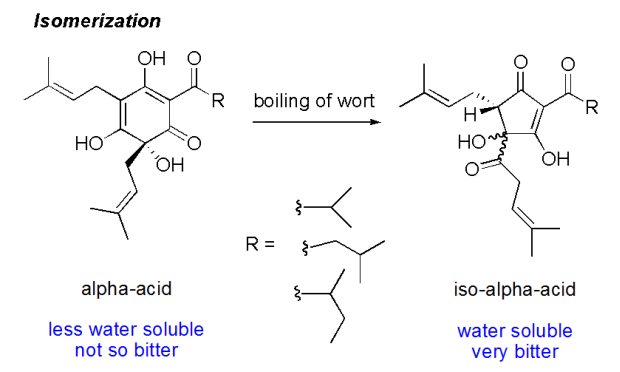 When hops are added to boiling wort, an isomerization happens in the boil and the alpha acids are converted to iso-alpha acids. Since the most common alpha acid is humulone, the most common iso-alpha acids are cis- and trans-isohumulone. There are several ways to mathematically estimate what the IBUs of a beer are going to be based on the rough alpha acid concentration reported on the bag of hops you use. The three most popular calculations are the Rager, Tinseth, and Garetz equations. I personally use the Tinseth equation. I like the Tinseth equation because it takes into account the gravity of wort, which affects solubility of the acids. You can read all about that sort of thing on Greg’s page. Other calculations often ignore this factor, which could lead to significant differences in expected and resulting concentrations of alpha acid. I believe many online calculators use the Rager equation which also takes into consideration gravity of the wort. So while researching how to measure IBU, I found an old protocol from the 1960s on how to measured the concentration of iso-alpha acids (and therefore IBUs) of a beer. 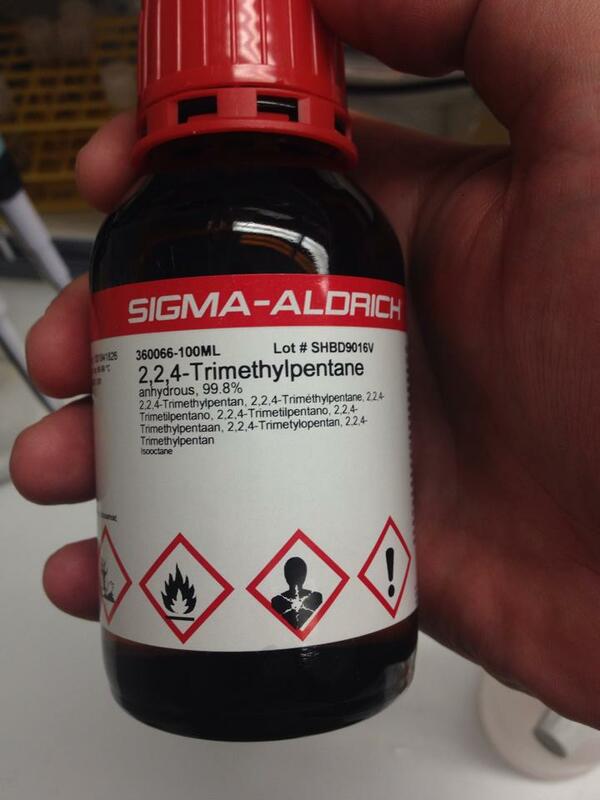 First, I ordered some 2,2,4-Trimethylpentane also known as isooctane. This method of measuring the amount of isomerized alpha acid in solution is not the current method used (I’ll write about that one later) but it is an older method that is easy to do. The principle here is to do an organic extraction of the beer. By mixing the isooctane with the beer, the two naturally separate, like oil and water. The isooctane “floats” on top of the beer but by vortexing the solution for seveal minutes, the organic components of the beer can be moved to the organic phase, the isomerized acids are soluble in the isooctane and get absorbed into that phase. Then the task becomes measuring how much alpha acid is in the organic phase. This was done by doing a spectra of the solution and measuring absorbance at 275 nm, a wavelength of light absrobed by the iso-humulone. Knowing that number and the extinction coefficent of iso-humulone, calculating the IBU was easy after there. Vortex for 2 minutes to make an emulsion of the organic and aqueous phases. This shaking allows for the extraction of the acid into the organic phase. Allow the phases to separate and remove organic phase. Read absorbance at 275 nanometers against reference of iso-octane. 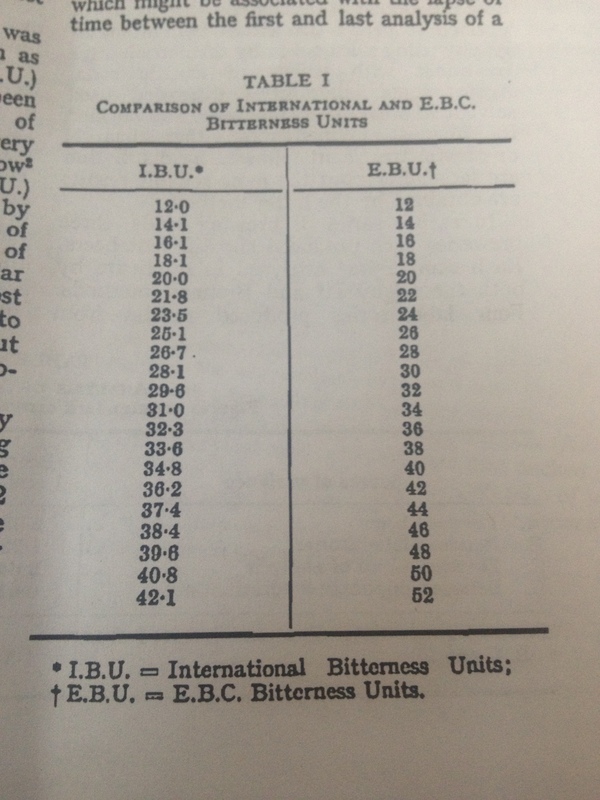 I cannot locate it now, but the paper I was using for this protocol had a table that converted EBU to IBU. I tried to Google it but there seemed to be a disagreement online if there is a difference. The paper I was using was from the 60s so there was likely a correction added for the coversion from metric to English units. That is the likely difference although the numbers were really close. Once I find it, I will take a photo of the table and post it on here (hopefully tonight). I decided to test three samples, two Galaxy saisons I’ve brewed recently and a homebrew from a friend that we both agreed was really bitter. The Niciu IPA, provided by a friend and fellow homebrewer, was made for an “unreasonably hopped” club competition for the DC Homebrewers. The original extraction reading was “out of range” for the instrument I was using, meaning it was higher than “3”. I made a 1 in 10 dilution of the organic and got a reading of 0.431….this is likely not an accurate reading for a few reasons but this is a crazy bitter beer, so I marked it in the table as >150, apparently it is out of the range I can detect. It shouldn’t surprise me that my numbers were close to the deconvulated IBU numbers given by the table in the paper…I was surprised how close. I’m also quite shocked with the result of the Niciu IPA. I think one of the problems with this technique is the linear range and reproducibility. I’m going to test a lot more samples in the coming months but overall this is a relatively silly technique. It requires pipetting the same amount of isooctane into several samples, there are several variables that might affect the outcome of the extraction, such as temperature and time mixing. I tried to keep these things as similar as possible but even with just three samples I ended up with variation in the organic phase, the Niciu IPA had a precipitate on top of the organic phase. Obviously if this were a lab, the samples would be tested multiple times to get enough data to do some stats but I’m not going to bother. I hope people found this interesting, I loved doing it. Hopefully I can research additional techniques for measuring hops contributions to beer and write about those as a follow-up. I wonder if a quick trip to a sonic bath would help your extraction efficiency and add a bit of consistency? Either that or a paint shaker. Pretty neat experiment though. I bet the extraction maxes out after a minute or so….there is definitely a sort of “phase” of the organic where it turned really milky but cleared up in a few minutes. I vortexed until that happened in all the samples, roughly 2 minutes each. Very cool article. I am looking to do some hops/IBU undergrad research myself. If you wouldn’t mind, have you found a better way at determining the IBU content? Thanks for your help! I haven’t attempted any other way, I was surprised how accurate this was honestly. I talked to a few people after I posted this article about how it is done in the breweries that actually bother, and this is the way they all do it. Hey, can you please post a reference to the 1960’s article on how to measure the concentration of ISO-alpha-acids from beer. This would seem a little tricky if you don’t know the partition coefficient of your iso alpha acids. Since they are soluble in water some material will remain in your aqueous layer. Also, each diastereomer of each iso alpha acid would have slightly different partition coefficients. Why can’t you just take an aliquot of your beer, dilute it with a solution that has a specific concentration of a known compound, and get throw it in on a GCMS? I picked up homebrewing in graduate school when I was completing my PhD in organic chemistry. I sythnesized a few terpenes in those days. Maybe because I don’t have a GCMS to use at my discretion. I believe GC/MS would be an inefficient method for analysis of iso-alpha acids as they have low volatility and would require derivatization. HPLC has shown to be a superior method which can actually separate cis and trans isomers of each analog (humulone, cohumulone, and adhumulone). This allows for the direct quantification of isomers which contribute to beer bitterness as opposed to measuring by spectrophotometry which results in higher IBU values due to concomitants which also absorb at 275 nm but do not contribute to bitterness. But again, this is a much more advanced and expensive method and not everyone has access to analytical instruments. Great article Matt! Keep up the beer research! I’m playing around with a Specto at the moment, and I’ve measured ibu from the wort at yeast pitching. This beer uses only whirlpool hops and I assumed 15% utilization, which should give me about 20ibu in the finished beer. The spectro measured 56ibu in the wort. It will be interesting to see what it measures at the end of fermentation, and get an idea of how much BU is lost in the fermentation to yeast. Likewise, also to see if dry hopping has an impact on the results on the specto. In another beer, it’s should measure about 35-40ibu mainly again from EOB and whirlpool hops (5ibu from boil @ 60mins). Wort measured 130ibu at pitching, and 90ish after 15hrs into fermentation. I’m still trying to wonder how that much ibu can be soluble in the wort, and this is not even the highest hopped beer I have. Matt, I am getting everything ready to start IBU testing at our brewery and have been looking at different Spectrophotometric methods for IBU. We predominately use ASBC for most of our methods, and when comparing their method to yours above there are a few differences. You use less sample, reagents and a vortext for mixing. Have you done any trials or have any info comparing your results to ASBC’s method/results? I have done numerous liquid-liquid extractions in the past and only vortexed for the extraction step and using less reagents would be ideal as well. If you could pass along the method you took this from or had any trial results it would be much appreciated to see them.